This article is about the series of games. For the eponymous franchise, see Carmen Sandiego (franchise). For the eponymous character, see Carmen Sandiego (character). For the Netflix animated series, see Carmen Sandiego (TV series). For other media called "Carmen Sandiego", see Carmen Sandiego (disambiguation). Carmen Sandiego is a series of American educational mystery video games which spawned an edutainment franchise of the same name. The game released in 1985, Where in the World Is Carmen Sandiego?, triggered both the video game series and the franchise as a whole, which has continued up to the present day. Each game of the series has a particular theme and subject, where the player must use their knowledge to find Carmen Sandiego or any of her innumerable henchmen. This series was originally owned by Brøderbund, but is now owned by The Learning Company, whose latest release was Carmen Sandiego Returns in 2015. Since its initial release the series has won over 125 awards and accolades. The first game in the series released in 1985, Where in the World Is Carmen Sandiego?, was designed and written by Gene Portwood and Lauren Elliott, and programmed by Dane Bingham. It established an original formula that was followed very faithfully in all Carmen Sandiego games. This formula involves a series of missions in which the computer player tracks and apprehends each of Carmen Sandiego's underlings. Each case begins with the player being alerted that a spectacular theft has been committed. Immediately transported to the scene of the crime, the player must find clues to infer the suspect's next destination and to create an arrest warrant describing the guilty party's attributes. The culprit travels through a series of different destinations in an attempt to shake off any pursuers, so the player will have to continue tracking the thief for some time. The game continues in this manner until the player catches up with the culprit, at which point the thief is arrested, and if the warrant is correct, the player puts the thief in ACME prison. As more and more thieves are arrested, the player rises up through ACME's ranks, and the later cases assigned to the player will become more difficult. On the final case, the perpetrator is revealed to be Carmen Sandiego herself, and the game ends after the player successfully captures her and is inducted into the ACME Hall of Fame. With the release of Word Detective, Math Detective, and Great Chase Through Time, Brøderbund began to abandon the original formula in 1997. Word Detective and Math Detective involves the player infiltrating V.I.L.E. hideouts around the world and therefore maintain the globe-hopping element of previous games. However, Great Chase Through Time completely abandoned the series' original formula and has the player spending each mission in one time period, where the goal is to create makeshift solutions to any historical problems that the theft has caused and find the thief whom Carmen Sandiego has dropped off. The final mission of the game involves the player to track down Carmen Sandiego similar to the traditional formula, although the player does not construct a warrant. The character of Carmen Sandiego was developed by David Siefkin, who drafted the first script of the game for Broderbund beside the Strawberry Canyon swimming pool of the University of California at Berkeley in 1984. Siefkin combined the character's first and last names from the Brazilian singer and actress Carmen Miranda and the city of San Diego, California. Carmen Sandiego was just one of several villains in the original script. She was chosen for the title role by the early project manager Katherine Bird because her name suggested mystery and exoticism, as well as humor. Siefkin departed the project shortly after writing the first script to become a Foreign Service Officer for the U.S. State Department, and served as a press and cultural attaché in several of the countries featured in the game. The games created by Broderbund featured silly humor and especially a distinctive style of word play with extensive use of puns, rhymes, and alliteration. This style of word play was also present, in varying degrees, in all three Carmen Sandiego television shows. Gag names ("Hardley Worthit", "Rob M. Blind", "Ruth Less", "Joy Ryder", "M. T. Pockets", etc.) were quite frequently used in the games, often to the point where Carmen herself seemed to be the only person without such a name. Clues about the suspect's next destination often used extended puns (example: "I pumped her for information, but her unrefined answer only suggested a crude plan to visit oil wells near Ahvaz.") or rhyming couplets. Even as the games began to abandon their original formula, this word play was still retained. For example, a news report on massive blackouts from Carmen Sandiego Math Detective quotes an official as saying, "We're taking a dim view of the situation." Although Carmen's V.I.L.E. gang members were often portrayed as cartoonish buffoons, they seemed to be capable of "stealing" landmarks, cities, national parks, notable cultural exports (such as "stealing all the sushi from Japan") and the like. Her thieves have also been known to steal geographic features and even nonexistent map features such as the Mason-Dixon line. Some thefts were even non sequiturs based on word play, such as "robbing the banks of the Nile," or plays on the word "steal" such as "stealing the show." The original version was released in 1985. The goal of this game is to track Carmen's villains around the world and arrest them and later ultimately arrest Carmen herself. In order to make an arrest the user had to have a warrant for the correct villain. The player began the game by visiting the city and country where the crime took place, and then obtaining hints from the bystanders on where the thief went next, leading them on a chase around the world to find the thief before they "get away." In the process, the player collected clues about the villain’s identity to determine who the culprit is. When the player reached their final destination, the player presented the accurate warrant to arrest the villain. The deluxe version was released in 1992 and featured additional animation and a reworked interface. Sarah Nade was added to this version of Carmen Sandiego Software. CD-ROM versions for DOS and Macintosh were released in 1993, and a Windows version was released in 1994. The windows version was later re-released as Where in the World is Carmen Sandiego? Classic Edition. The reboot version was released in 1996 with a new gameplay interface and animated characters. This version also features QuickTime videos of Lynne Thigpen reprising her role as "The Chief" from the eponymous PBS game show, a role she would later also play in the U.S.A. and Time reboot games released during the same period. This title was released in 1986. Similar to World, the goal of this game is to track Carmen's villains around the United States, and arrest them and later ultimately arrest Carmen herself. In order to make an arrest, the user must have a warrant and, obviously, it has to be the correct warrant. The user gets information from the bystanders on where the thief went next and what the thief looks like. When the user reaches his/her final destination where the villain is going to pass off the loot to Carmen, he/she have to arrest them. Title card for Where in Europe Is Carmen Sandiego? Main article: Where in Europe Is Carmen Sandiego? "Where in Europe Is Carmen Sandiego?" is one of the many games in the Carmen Sandiego series. It focuses on the European history and geography. The gameplay is very similar to that of "Where in the World", meaning that the player is sent to a location, has to find clues to lead them to the next location, and builds up a warrant along the way. This was the first of the games to have a database built into the crime computer, where players could narrow down their next stop by entering information such as flag colors, currency used, and languages mentioned. Production of the game was discontinued in 1990 due to the fall of the Eastern Bloc and drastic border and government changes that resulted. The original version was released in 1989. The goal of this game is to track Carmen's villains through history and arrest them and later ultimately capture Carmen herself. The reboot version was released in 1997 and later renamed Carmen Sandiego's Great Chase Through Time. This version was heavily influenced by and features villains from the short-lived PBS game show. Main article: Where in North Dakota Is Carmen Sandiego? Main article: Where in America's Past Is Carmen Sandiego? Asking a witness for clues in Where in Space Is Carmen Sandiego? Main article: Where in Space Is Carmen Sandiego? Published by: Brøderbund Software, Inc. The intention of this game is to teach astronomy. The player flies in a rocket ship throughout the solar system, interrogating various alien lifeforms in order to solve the theft of an important part of the solar system (e.g. Saturn's rings). There was only a limited amount of fuel available for travel. So if the player did not ask the right questions on the right planets, or followed the wrong clues, the criminal(s) would get away, leaving the player to start anew with another crime. This version is somewhat similar to Where in the World Is Carmen Sandiego?. Kneemoi was introduced in this installment. This title was released in 1995 and features characters from the Earth animated series. It uses a simplified version of the standard gameplay designed for younger players. This title was released in 1997. This game is intended to teach language arts for kids age 9-12. The game features Chase Devineaux. In the game Carmen Sandiego has invented a machine called the Babble-On Machine, and the user, playing the role of Agent 13, has to thwart her plans and free all the other agents which have been captured by Carmen. This title was released in 1998. This game is intended to teach Math for kids age 9-12. The game features Chase Devineaux. In the game, Carmen Sandiego has invented a machine called the Quantum Crystallizer, and the user, playing the role of Agent 9, has to thwart her plans and restore 12 landmarks that Carmen has shrunk with the machine. This game teaches multiple subjects for kids ages 9–12. It was also the first title in the Carmen Sandiego series to be released by The Learning Company. The game features Chase Devineaux. In the game, Carmen Sandiego has invented KnowBots to steal knowledge and the player(s) have to try and thwart her plans. This game is set up much like the Carmen Sandiego game shows on PBS and is the only multiplayer game of the series. This game was released in 2001. This game is the first in the series to give the player complete control of a character in a 3D world. The avatar, Cole, must maneuver through stages including a museum in New York City, the beaches of New Zealand, and Machu Picchu. The player fights against Carmen's robots and spirits to prevent her from stealing an enchanted diamond, the repository of all the knowledge of the nations. This is a French Carmen Sandiego game released in 2009. This is a series of games released in 2011/2012 for the Wii . This is a Carmen Sandiego game which was based on the game shows and video-games, and "was used as part of a classroom-based customer service training course at Scandinavian Airways Systems (SAS)". The date of release is unknown. This title was released in 2002. The game starts with the ClueFinders proceeding to walk towards a creepy house on a hill, with the dialogue explaining that the ClueFinders received an email from who they thought was Joni's Uncle Horace, stating that he was trapped in the house and needed to be rescued. However, it is revealed that it is actually a trap, and the four ClueFinders are separated. It is then shown to the user that four past ClueFinders enemies have joined forces with a mysterious new ally and created the trap to get revenge on the ClueFinders. At the game's conclusion seeing that ClueFinders have outsmarted the villains again, their leader sends the villains into their own traps as punishment for failing. Afterward, she reveals herself to be Carmen Sandiego. Before anybody can do anything, Carmen escapes and leaves the ClueFinders. Santiago later utters the all-too-familiar phrase of, "Where in the world did she go?". In 2011, a Facebook version of Where in the World Is Carmen Sandiego? was released. In 2019, Google partnered with Houghton Mifflin Harcourt to develop a series of Carmen Sandiego capers that utilized Google Earth as the world map, the first released in March, but otherwise playing out similar to the original games. Where in Hell is Carmen Santiago? 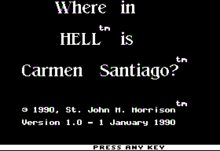 is a 1990 game developed by St. John M. Morrison, which has players hunt down Carmen in the afterlife. Broderbund does not recognise this as a part of the series. It has the status of "a Copyrighted FreeWare". The title screen started with the word "Heck" which was rubbed off and replaced with "HELL". The creator of the game had never played a Carmen Sandiego game, but was very familiar of the franchise due to its constant appearance in gaming magazines. He crafted a first person adventure game based on this premise and copied the naming scheme of the titles. The beginning of the plot is as follows: "You are a famous crimebuster hot on the trail of that world-renowned thief, Carmen Santiago (sic), and her latest gang. The rumours that she had died in a bizarre accident don't deter you; after all, it might just be misdirection. So you track her to the Dark Woods of I/O Error, where you encounter three hideous beasts and lose your way in the night." "In Where in Hell is Carmen Santiago?, you will need to use your detective skills and knowledge of facts from Canticle One of Dante's Commedia: Inferno." Players have 140 turns to be successful, and can do the following commands per turn: move up, move down, view map, inventory, call a name, use an item, look around, search for items, save, restart, quit, and sound off. The author explains: "The machine-language segments for this program were assembled using Merlin Pro; the Dore illustrations were digitized in two ways—first, using the Micro D-Cam (available from MicroMint) and second, using a "dedicated graphics preprocessor" (labelled "Macintosh") with an Apple Scanner, and converted using "Apple File Exchange" and a neat-o freeware program, "MacDown" by Jason Harper; the Benguiat font in the startup screen is from Fontrix; the sound is from "Sound Master" by Jim Richardson, presented in the September 1988 issue of _Nibble_; and various BASIC techniques are thanks to the staff at A2-Central magazine." "James Keim, Ed Lundberg, and Douglas Cuff all reviewed the teaching program "Where In Hell Is Carmen Santiago? ", which had been designed to teach about Dante's Inferno. This unusual method of having three people review the same program resulted in a very interesting look at the product from more than a single point of view." Sandiego Inc. is an app in the same vein as the Carmen Sandiego series. AndroidGuys wrote the title "preys on people’s nostalgia for the Carmen Sandiego series". The game The Treehouse featured the Carmen Sandiego theme as a song to play on its keyboard minigame. ^ Houghton Mifflin Harcourt. "Carmen Sandiego Returns: Houghton Mifflin Harcourt Launches Character's First-Ever IOS App". Retrieved April 25, 2017. ^ Craddock, David (September 15, 2017). "The Making Of Carmen Sandiego". Kotaku. Retrieved September 15, 2017. ^ Schrage, Michael. "Bye-Bye Blackboards". Retrieved November 16, 2012. ^ Prensky, Marc (2000). "EXCERPTS FROM DIGITAL GAME-BASED LEARNING". Archived from the original on March 22, 2013. Retrieved November 16, 2012. ^ Lee, Dami (March 12, 2019). "Now you can try to catch Carmen Sandiego in Google Earth". The Verge. Retrieved March 13, 2019. ^ a b c "Where in North Dakota is Carmen Sandiego? Game Review". YouTube. 6 February 2015. ^ "Please Register This Shareware". tumblr.com. ^ "Games that predate popularizers". proboards.com. ^ Arici, Alexandra (2018-04-23). "Sandiego Inc. review - a very simplistic and not very challenging detective game". AndroidGuys. Retrieved 2018-09-06. ^ "Sandiego Inc. Review - Why in the world was this game made? - FNGR GNS". FNGR GNS. 2018-02-26. Retrieved 2018-09-06. ^ Arici, Alexandra (2018-04-23). "Sandiego Inc. review - a very simplistic and not very challenging detective game". AndroidGuys. Retrieved 2018-05-05.